Often clients complain about their coffee machine not making good coffee anymore. Here's some tips on how to check and correct this problem. 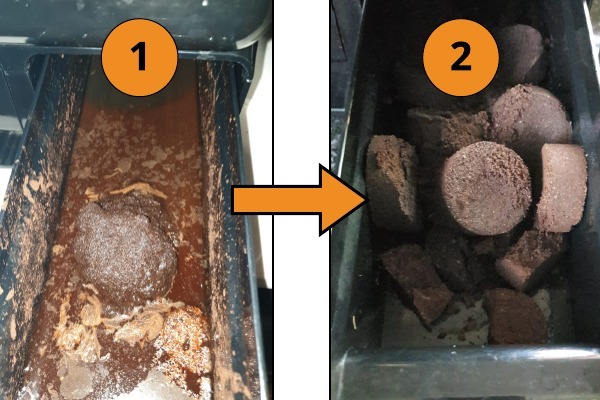 The above two images shows the dreg drawer of a bean to cup coffee machine. Image 1 clearly shows a lot of liquid and a muddy/sludge of used coffee. NOT GOOD! Image 2 has no liquid in the dreg drawer and a bunch of neatly compressed coffee pucks (cakes). VERY GOOD! Image 2 will make a beautiful full-flavoured espresso with crema on top. How to get from image 1 to image 2? Make sure the brew unit is clean and well serviced with new O-rings. 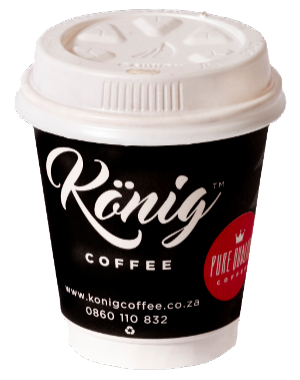 Some machines has removable brew units, like our König range and Saeco machines. Some manufacturer like Jura do not have removable brew units BUT you can and should run regular tablet cleaning to prevent the brew unit from clogging up. For these machines we remove these brew units as part of the annual service for thorough cleaning. Check your grinder settings. Inside or next to the bean hopper you will find an adjustment knob to adjust the grinder coarseness. Do not perform major adjustments here! You should only do minor adjustments WHILE the grinder motor is running (press espresso and while it is grinding do a small adjustment at a time). Most often we find the coarseness is too fine, so adjust it a little bit coarser and then make 2 more espressos after that to see the new grind and setting coming through. Repeat the process 2 or 3 times. If still no change, rather bring it in to our workshop for assistance please. It could be that your machine has a more advanced problem like a water pump that is not pushing the water through the system at the right pressure anymore, or the grinder motor or grinder blades that is either damage or just not working properly anymore. So if the above do not get you to image 2, then please contact your nearest franchisee, or one of our workshops, for assistance.